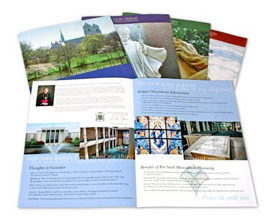 Full Color brochures are a great way to get results while keeping advertising costs down. Available in multiple sizes, brochures impact your customers and contain essential company information. Standard sizes can be used to comply with mailing specifications. However, we regularly produce custom size brochures to suit the needs of our clients. Inquire about our mailing services to compliment your order. Save yourself time, money, and headaches, by keeping it all under on roof. 1.Select options for your brochures. 2. Add brochures to your list..